Every Canadian has a dream that if they work really hard, never give up, and all the fates align, they might win one of these every four years. And then they’ll put it on top of their Olympic gold medal. And, in what turned out to be his last act as a member of the Canucks, Roberto Luongo made sure to tell the world about it. Wait, Luongo narcs on fellow goalies who have the occasional poop situation? No wonder old man Thomas was in such a hurry to get out of Florida before he arrived. In honor of the trade deadline, this week’s obscure player is Alan May, the veteran tough guy who holds the honor of being the deadline’s most traded player. As outlined earlier this week in this entertaining profile, May was traded five times in his career, with four of those moves coming at deadline time. Alan May debuted in 1987 and made a name for himself during the late ’80s and early ’90s, which was pretty much the golden age of NHL enforcers, so it goes without saying that YouTube is filled with clips of him doing his thing. Here he is fighting Tie Domi and holding his own. Here he is fighting Tony Twist and holding his own. Here he is fighting Wendel Clark and, uh, well, don’t fight Wendel Clark, kids. And here he is skipping off the ice and high-fiving Washington tag-team partner John Kordic after a brawl, which I could swear I remember happening about three dozen times in 1991 even though they played together for only seven games. The early-’90s Capitals were a lot of fun. 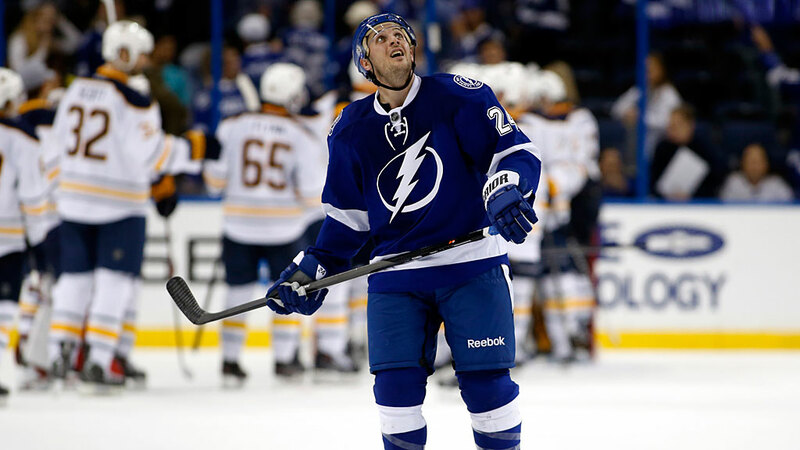 May finished his career with 393 games played, 1,348 penalty minutes, and a respectable 31 goals scored. He currently works as an analyst for Capitals broadcasts. This Week’s Debate: You are an NHL general manager, and it’s trade deadline week. Should you make a major trade? In Favor: Yes, please. Trades are awesome, and fans love them. The bigger the better. Get dealing. Opposed: Uh, I think I’ll pass. In Favor: Why? It’s deadline week! Get on the phone and make something happen! Opposed: But trades are hard. In Favor: Yes, we realize that. We don’t care, though. We’ve got 20 hours of deadline day TV to fill, so make some deals. In Favor: We don’t care. In Favor: Yes, we know it’s hard. Making trades in today’s NHL is difficult. We all get that. But it’s also a major component of your job. You know, the one you get paid millions of dollars to do. So figure it out, you cowering baby. Opposed: But … but … you can make a mistake on deadline day. In Favor: Oh, here we go. In Favor: Your prospects are terrible. Opposed: And we don’t want to upset our delicate dressing room chemistry. In Favor: That’s not a real thing. Opposed: And sometimes teams make trades and don’t win the Stanley Cup, so therefore nobody should bother trying. In Favor: That doesn’t even make sense. Opposed: We don’t make trades just for the sake of making a trade. Opposed: And remember, sometimes the best deals are the ones you don’t make. In Favor: [Looks up from filled-out card labeled “Whiny NHL General Manager Cliché Bingo.”] I won. Thanks. Opposed: Oh. Uh … congratulations. In Favor: What about your bingo card? Didn’t you fill it out? Opposed: I realized there was a chance I might not win, so I decided to not even try. The Final Verdict: Next week, instead of submitting columns I’m going just tell my editors that “hockey writing is too hard” and then not do my job. I’ll let you know how that goes. Wednesday’s trade deadline officially arrived at 3 p.m. ET. But as anyone following the day’s events soon realized, there were still plenty of breaking deals left to come. That’s because of a quirk in the NHL’s transaction system that’s become an annual trade deadline tradition: Deals can’t become official until the league has held a trade call, and the last-minute rush at the deadline inevitably results in a backlog that can stretch for hours. That’s fine, of course, and over the years the NHL has even been kind enough to show us what an actual trade call looks like. That was pretty cool. The whole thing seems vaguely complicated, which I guess makes sense when you’re talking about what amounts to a multimillion-dollar business transaction. All of which always makes me wonder: Where is all of this on draft day? You know, the other day of the year that features lots of trades? If anything, we get even bigger deals on draft day because all the GMs are in the same room and teams aren’t tight against the cap. And yet deadline day features hour-long delays, while the draft basically involves GMs bumping into each other in an aisle, followed by Gary Bettman kicking over chairs as he sprints up to the podium to announce a completed trade 15 seconds later. I guess what I’m saying is: Who’s the guy in charge of process efficiency at the draft, and why can’t we hire him on deadline day, too? This week’s hockey pool owner we all hate is the guy who watched a little bit too much NHL trade deadline coverage this week and is now annoying everyone by spamming the whole league with trade offers. Settle down there, Trader Joe. We all enjoyed deadline day too, but we don’t need to relive it in the form of an inbox full of offers from you. This is why we all wanted to move the trade deadline up this year. Take a deep breath, please, because right now, the rest of us are ready to waive our no-strangling-you clause. And that goes double for the guy in the league who’s decided he wants to be the insider who breaks down all the league rumors. This is the guy who keeps texting you with stuff like, “Anything cooking?” then immediately drops by your desk to ask, “Are you working on anything?” Yes. Yes, I am working on something. It’s called my work. Get out of my cubicle before I call security. Hm. Actually, now that he’s gone, you probably should give your roster a quick double check. You know, just to make sure. That was fun. Trade deadline week really is the best. Without question, the most shocking trade of the week was the Panther-Canucks deal that sent Roberto Luongo to Florida. 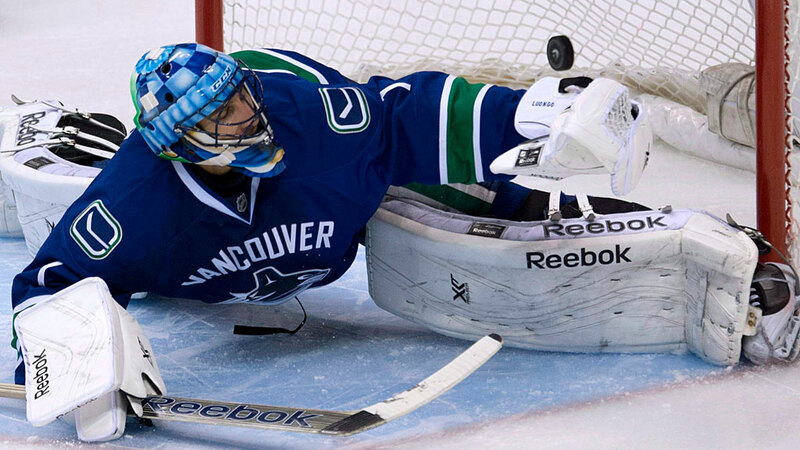 Luongo had been on the trade block for years, thanks to the emergence of Vancouver backup Cory Schneider. But when the Canucks couldn’t find a taker for this contract, they decided to move Schneider instead, sending him to New Jersey at last year’s draft. That left Luongo as the undisputed starter … right up until this week, when Vancouver traded him, too. And so here we are. One year ago, the Canucks had arguably the league’s very best goaltending duo in Luongo-Schneider. Now, somehow, they have neither. It’s been a tough stretch for Vancouver fans. So let’s help them out by taking some time to look back on the two goalies during happier times. Let’s travel all the way back to … a few months ago. • So, it’s February 10, 2013, and we’re in Vancouver for the annual Canucks skills competition. It’s a nice event that benefits a local charity, and it gives the players a chance to have a little bit of fun in front of the home fans. We’re just wrapping up the hardest shot competition, and each team has one shooter left. It’s about to get silly. It’s about to get bizarre. It’s about to get inexcusably awful. • But enough about the music. • Yes, we’re going to get to enjoy some goalies trying to take slap shots. First up is Luongo. When we see him he’s swiveling back and forth frantically, either because he’s trying to warm up or because he’s working on an impression of Mike Gillis making a decision about his goaltending. • Luongo takes a few strides toward the puck, winds, and fires. It’s not much of a shot, but it does go in. At this point, I’m assuming this clip edits out the 15 minutes he spent yelling, “Oh look, I shot a hockey puck into the net, maybe you guys could think of trying that some time?” at his confused teammates. • Attempt no. 2 seems to ring off both posts and out. “That didn’t even register,” the announcer informs us. Apparently it had Ryan Kesler’s trade request taped to it. • Luongo decided it must be the stick’s fault, proving that the Vancouver media has taught him a thing or two about how to scapegoat an innocent party. He borrows a replacement from Chris Tanev. Fun fact: On the day this event took place, Chris Tanev had one career goal. • I’d make a mean joke about that, but the sudden appearance of Dan Hamhuis’s adorable daughter wearing a tiny Canucks jersey and matching skirt has caused my heart to grow three sizes. I’m filled with goodwill toward the entire human race, rendered completely unable to derive joy from cruelly mocking my societal betters. • Give me a second, I’ll walk it off. • OK, I think we’re good. • Luongo’s third shot is marred by an unfortunate technical glitch that causes the radar gun to instead display his save percentage from the 2011 Stanley Cup final. • Next up is Schneider. You’ve probably noticed that he’s a redhead, and you’re expecting me to slip in some sort of joke about that. Sorry. I don’t do jokes about physical appearance. We all have to draw a line somewhere, and this is mine. Not going to happen. Go find your cheap redhead jokes somewhere else. • So Schneider steps toward the puck gingerly and rips a 72.3 mph shot, which is enough to clinch bragging rights over Luongo on the first attempt. Can we just take a moment to acknowledge the great work being done by the referee here? Good job occasionally pointing at people. You’d hate to see this thing get out of control. • In case you were wondering, despite the difficult circumstances, Luongo and Schneider got along well during their time in Vancouver. They even participated in this fun segment for TSN, which features the best acting ever seen from Canucks players who weren’t trying to draw a penalty. • Schneider hits 75.3 on his second shot. Um, are we sure that cameraman who’s been lying facedown in the corner for this entire thing is OK? Has anybody else been worried about him? • Schneider’s third shot is a 76.4. At this point, he skates to center ice to accept his first-place prize, then stops to wonder why it’s a front-row ticket to watch the ghost of Martin Brodeur stand in front of a red light. And that’s it. Nothing else especially interesting happens in this clip. We just fade to black, right after the camera briefly pans up to the rafters, where a silhouette that looks suspiciously like Eddie Lack is rubbing its hands together and laughing ominously. That part probably won’t turn out to be important, right?